Great Russian literature is filled with accounts of elaborate feasts of tsars and aristocrats where there are golden samovars, exotic imported ingredients, and dishes taking the names of noblemen like Beef Stroganoff and Veal Orloff. But what about the real food of the people who populated the vast landscape of the country? Rivers, lakes and woodlands provided an abundance of natural resources. Fields were planted with a variety of grains. And many recipes of the people have remained unchanged for centuries, such as borscht, bliny, kasha, pirozhki and pelmeni. The history of Russian cuisine is rich in historical and cultural contexts and is, above all, a tale of hospitality. 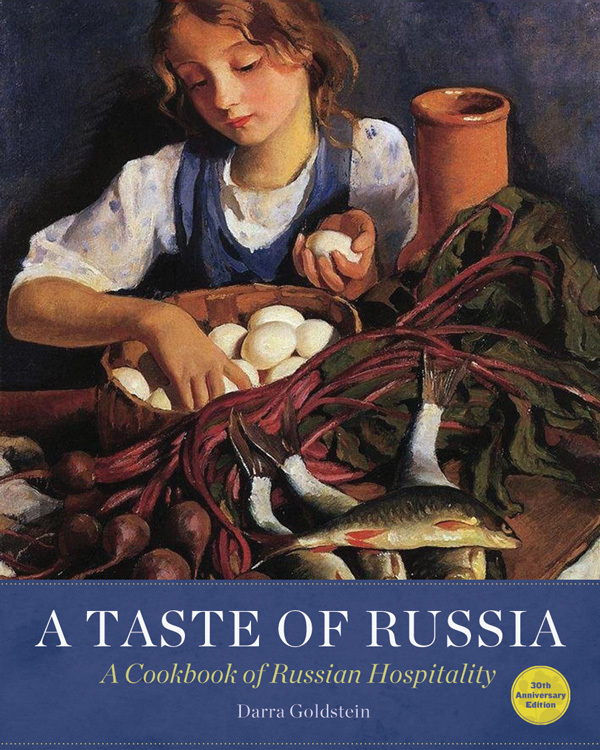 Join us as Darra Goldstein takes us on a journey through the varied culinary landscape of Russia, past and present. Darra’s cookbook A Taste of Russia will be available for sale, and classic Russian recipes from the cookbook will be prepared by CHNY members for a tasting. Darra Goldstein, PhD, is Food Editor at Russian Life magazine, Founding Editor of the quarterly magazine Gastronomica: The Journal of Food and Culture, and the award winning author of four cookbooks including A Taste of Russia. She is the Willcox and Harriet Adsit Professor of Russian at Williams College. Culinary Historians of New York (CHNY) was founded in 1985 to stimulate and share knowledge of the ways food has affected humans (and humans, food) since earliest times. Members of CHNY include chefs, cooking teachers, historians, anthropologists, food writers, food editors, food stylists, researchers, librarians, caterers, collectors, and nutritionists. Lots of people who simply enjoy learning about, cooking and eating good food are also enthusiastic contributors. At monthly meetings, workshops and field trips, CHNY members explore the historic, esoteric, and entertaining byways of food. These events are led by noted authors, anthropologists, and food and wine experts, many of them CHNY members, who illuminate the role of food in the distant and recent past as well as the present. The events are as lively as they are scholarly, often accompanied by tastings, and always informal.